UPDATE: This post has been changed since it was first published. Information on Matt Dillon’s partnership in Nettletown have been added. Choi is a co-founder of Foraged & Found Edibles. 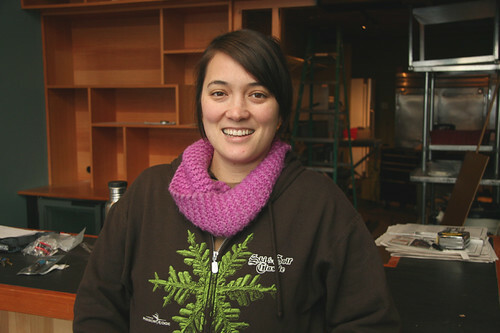 Eastlake native and wild foods guru Christina Choi will be opening a new restaurant in the old Sitka & Spruce location at 2238 Eastlake Ave. E.
The restaurant will be called Nettletown and will open by the end of February, Choi says. Matt Dillon, owner of Sitka & Spruce, is a partner with Choi in the new restaurant. “I will be heading the kitchen and everyday affairs and Matt will be there to egg me on,” Choi says on her blog, Nettletown. Choi co-founded Foraged & Found Edibles with Jeremy Faber. The company supplies all kinds of wild ingredients — think mushrooms to ferns — to local restaurants. Choi also writes and publishes the Illustrated Wild Foods Recipe Calendar. Nettletown will be in the same vein, Choi says, with lots of wild food and seasonal and local items on the menu. There will be Asian and Pacific Northwest influences. And seafood as well. Choi says the new restaurant will in the style of a cafe with counter service. She’ll start with lunch and brunch and add dinner service later, she says. When I stopped by last week, Choi and her boyfriend were hard at work remodeling the old S&S space. “It’s taken longer than I would have hoped,” she said with a laugh. Choi not only lives in Eastlake now but spent her first five years just blocks from the new restaurant. Pretty cool! Choi has posted about the new venture on her Nettletown blog. The Weekly’s Voracious blog has an interview with Choi. And Seattle Magazine has a brief post about the new restaurant. This entry was posted in Uncategorized on February 3, 2010 by cdmilton. i didn’t think anything a cool a S&S would find it way there, but this sounds really promising! color me a customer in waiting.